1 - Userhat kneels before the 24 judges of the dead who are in turn in front of an enthroned Osiris, Horus and Thoth stand either side of Osiris. 4 - Userhat along with his wife and sister sit in paradise in the shade of a fig tree. A goddess from the lake pours them a drink and offers bread, figs, grapes and a honeycomb. Userhat along with another man and some wailing women make an offering to seated ghosts of Userhat's father and mother. (This scenes is repeated twice below, in the third repitition a man and a woman make offerings to the ghosts. 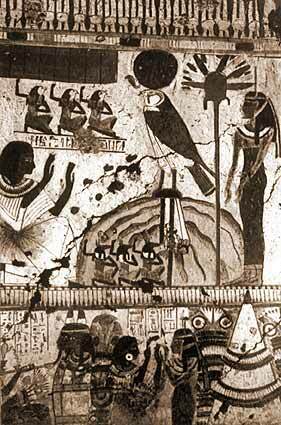 6 - Various members of Userhat's family make offerings to Tuthmosis I and Osiris. 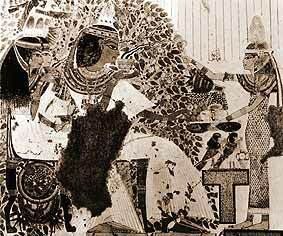 7 - Black statue of Tuthmosis I being carried towards a temple.